Students came out to help with recovery efforts in Albany, Georgia. Samaritan's Purse volunteers of all ages are working in Albany, Georgia, to help a community devastated by Hurricane Michael. As Hurricane Michael ripped through southern Georgia, Albany State University was forced to postpone their annual homecoming festivities. Classes were cancelled, and students were evacuated. More than 160 college students from Albany State University gave up their Homecoming morning to help families recover from Hurricane Michael. Photo courtesy of Sherwood Baptist Church. When students did return, the destruction they found in their community was profound. Determined to bring hope and joy back to the city of Albany, the university rescheduled its homecoming activities but added one event¬—the inaugural Homecoming Day of Service. More than 160 current and former Albany State students volunteered with Samaritan’s Purse on a Saturday in late October. Teams of volunteers helped affected families remove downed trees and clear storm debris. Miss Albany 2018, Alexandria VanDyke, applauded her fellow millennials for spending the morning serving their neighbors. “Seeing them out here early this morning ready to help and ready to go is just a wonderful thing for the community,” she said. Miss Albany 2018, Alexandria VanDyke, serves alongside more than 160 college students as part of Albany State University’s Homecoming Day of Service. Photo courtesy of Sherwood Baptist Church. Moments later, he received a call from a Samaritan’s Purse volunteer team leader. “He called me early and said, ‘We are going to have about 50 Albany State Students out there today’ and I just said wow,” William said. Ryan McClendon, 22, was thankful for the opportunity to give back to his community. A member of the Albany State University baseball team, Ryan had returned to his home in Atlanta to escape the storm. “I felt like I was helpless in Atlanta and I couldn’t help anybody or be a blessing to somebody,” Ryan said. Now, Ryan plans to continue volunteering with Samaritan’s Purse after classes and on weekends. Not all of the young people serving in Albany are from the local university. Siblings Benjamin and Amber Jensen drove 27 hours from Colorado to help hurting families in Georgia recover from the storm. Elizabeth Trephan, 18, removes a portion of a tree after it fell in a family’s yard during Hurricane Michael. Benjamin, 19, and Amber, 18, are devoting their time to serving the Lord while they are young and waiting to see what He has next for their lives. “Our desire is to do something for other people and be able to dedicate time solely to God and not worry about work and school,” Amber said. The Jensens also plan to serve with Samaritan’s Purse in North Carolina—in the aftermath of Hurricane Florence—before returning home for Thanksgiving. Watching homeowners respond to the work being done in Jesus’ Name is her favorite part of volunteering. “It’s so rewarding to see the joy on the people’s faces, and we get to give them a Bible and share the Gospel by our actions and what we do,” Elizabeth said. 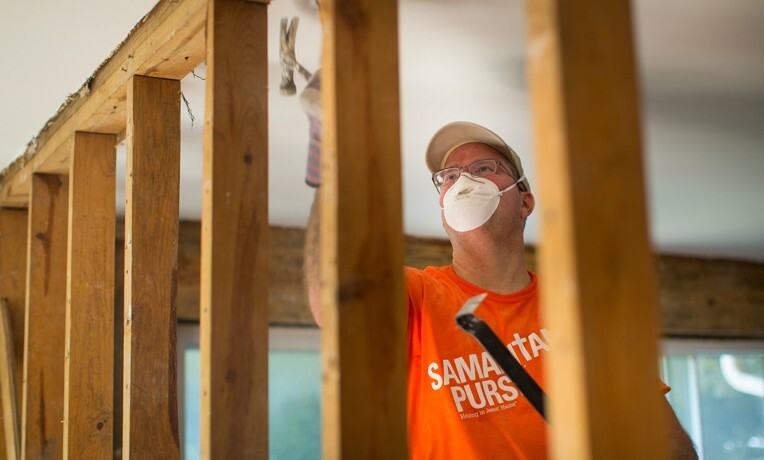 Samaritan’s Purse continues to work in five locations across Georgia, Florida, and North Carolina following hurricanes Florence and Michael. From these locations, plus a South Carolina site where we recently completed our efforts, more than 7,000 volunteers have served over 1,800 families in need. We’re mudding out flooded homes, tarping roofs, clearing fallen trees and spraying to prevent mold growth. We praise God that more than 200 homeowners have prayed to receive Jesus Christ as their Lord and Savior!